With extensive training in ceramic art and lead lighting in the 80’s, at Chisholm Institute in Melbourne, Kathryn majored in flat glass and acquired a love of strong colour placement and segmentation. Kathryn spent three years working in two studios in Boston USA, designing and manufacturing stained glass and sandblasted art for commercial venues and custom designs for private residences. Upon return home to Australia, she designed and built her own mudbrick house in the peaceful Central Victorian countryside, in Pipers Creek, a few kilometres from the township of Kyneton. It was the perfect environment in which to experiment with many different mosaicking techniques, which led to retail sales, public and private commissions, workshops, exhibitions and awards. 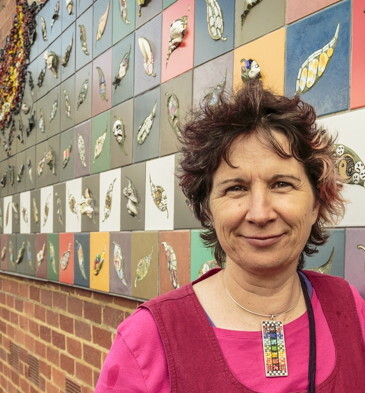 Best known for the Black Saturday Memorial in Kyneton, Kathryn has also created mosaic installations for the local schools, kindergarten and the nearby tourist venue – Kyneton Bushland Resort. stands in Kyneton’s Riverwalk Sculpture Park near the Piper St bridge.